Playing for the short-season Lowell Spinners in 2006, Ryan Khoury was called into the manager's office. The manager, Bruce Crabbe, had something to tell him. "When we got to his office, he said, 'Pack your bags, you're going to Pawtucket,' " Khoury told Baseball America that August. "I said, 'Are you serious?' I thought he might be kidding. But he said that he wasn't, and that I had 20 minutes to get ready. I guess I was shocked and excited as much as anything." It was a destination Crabbe had been to himself, as a player years before. Crabbe played at AAA for six seasons in the late 1980s and early 1990s. But he never made the next jump, to the majors. Crabbe has since gone on to a long post-playing career as a coach. manager and coordinator in the minor leagues. He also worked with a woman's team. Crabbe's professional playing career began in 1984, taken by the Cubs in the 19th round, out of the University of Florida. With Florida that year, Crabbe helped the Gators to the SEC championship, their second in three years. "I don't really remember how I felt then," Crabbe told The Gainesville Sun of the earlier championship, "but I know I felt good. But I don't know if I can beat the feeling that I have right now." With the Cubs, Crabbe started at short-season Geneva, in the same league he would later manage in. The infielder hit .307 with four home runs. He continued to hit well at single-A Peoria in 1985, hitting .313. Making the jump to AA Pittsfield in 1986, Crabbe hit .292. He earned Eastern League Player of the Week honors in early August. 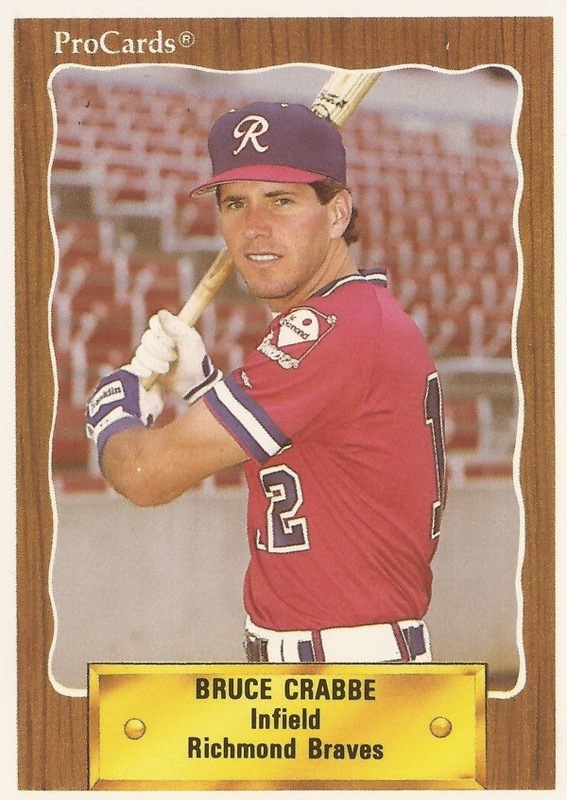 In 1987, Crabbe hit AAA for the first time. He would stay there through 1992. His average dropped that first year with Iowa to .251. By 1989, he hit .265 and had three home runs. Two of his home runs came on one May weekend against Louisville. That was his last year with the Cubs. He signed with the Braves for 1990, playing at AAA Richmond that year and the next. His final year came in 1992, playing with the Blue Jays at AAA Syracuse. His post-playing career began by 1994, managing the Pioneer League's Butte Copper Kings. By 1997, Crabbe had moved on to manage the Colorado Silver Bullets, the all-woman baseball team. That June, his woman's team got into a brawl, after an opposing pitcher laughed after hitting a batter. "I don't blame her," Crabbe told The Associated Press that June. "If Albert Belle gets hit by a pitcher who laughs at him, you think he might charge the mound?" From there, Crabbed moved to manage the rookie league Pulaski Rangers. There, he managed a young Kay-Jay Harris. Harris went on to quit baseball and turn to football, playing in the NFL. Crabbe served as hitting coach at AAA Oklahoma from 2001 to 2004. He then moved to the Red Sox system. serving as manager at short-season Lowell in 2006, 2007 and 2010. When he wasn't managing Lowell, he served as the Red Sox' roving infield instructor. For 2011, Crabbe is set to serve as manager at high-A Salem. In July 2010, Crabbe managed at Fenway Park, taking Lowell there for the Futures at Fenway game, playing Jamestown. Rain, however, shortened the game. And the Spinner bats had just started heating up, MLB.com wrote. They lost 7-2. "You never know what can happen at this level because it was so early," Crabbe told MLB.com. "We were still going to be aggressive. We put some pressure on and had some chances to score and just didn't come through."